It was looking ominous from two tables out when Jamie Gold, a talent agent from Malibu, California, built up a commanding lead of chips with a display of fearless power poker. No amount of prayers from the other eight players at the Final Table could prevent Jamie Gold from taking the Big One down aided, it must be said, by a very warm deck of cards that fired favourable cards at him on a regular basis. Whenever the chips went in, he hit the cards he needed or found a desperate opponent with inferior cards. None of the small stacks were going to get away with a bluff or hopeful stab at the pot if Gold had any workable two cards to call with. Jamie Gold has consequently walked away with the monstrous cheque of $12,000,000 and we can assume it will not be the last we will see of him at the poker tables! First to go was short stack Dan Nassif who put in a moderate raise after Jamie Gold limped into a pot. Gold made an automatic call for the odds. After checking in the dark, Gold called Nassif’s all-in flop bet and the latter found himself speared by Gold’s set of 2’s on a flop of 5, 3, 2. Nassif’s AK failed to save him from 9th place. The 8th place went to Swede Erik Friberg, who had gone into the final day in a comfortable 4th spot. His demise occurred once more at the hands of Jamie Gold who, once again, found good cards at the right time. Friberg slow-played JJ and re-raised Gold who he probably assumed was attempting a steal. Friberg’s re-raise all in went sour when faced with Gold’s very genuine pair of queens! Friberg takes home just under $2,000,000. Douglas Kim was next in line for door marked exit, and was one of the rare players not axed by Gold! The executioner was Paul Wasicka who raised pre-flop and was called by Kim. A flop of rags saw Kim move all-in with a pocket pair of 9’s. Wasicka released the blade with his queens! The ladies were proving lethal today but at least Kim had the consolation of a near-$2,400,000 payday. Down to six and soon five. 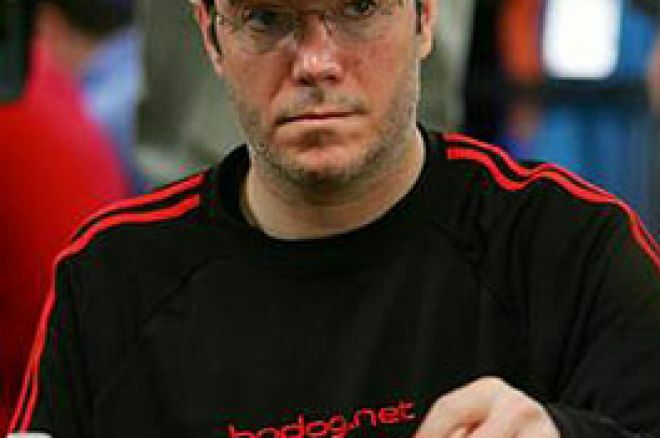 Veteran Richard Lee had been building a solid pile of chips but the prospect of causing a big dent in his own stack held no fears for Jamie Gold. A pre-flop re-raise by Gold coming over the top of Lee was not given sufficient respect – understandably perhaps as Lee was sitting with JJ. Lee re-raised all-in for a monster pot which Gold called with – you guessed it – QQ! Once more, Gold’s cards proved perfect in their timing. Lee took home approximately $2,800,000. Cries of “The Butler Did It!” would be misplaced here. Rhett Butler failed to do it and received the order of the boot in 5th place, swatted away once again by Jamie Gold. Butler had been keeping out of the action and no doubt was pleased to see the desperados ahead of him being mown down while he shot up the pay scale. However, Butler took his chances with a small pair of 4’s when both Gold and Allen Cunningham fired at the pot before him in the big blind. Here was perhaps a chance to triple up. The flop of J, 6, 5 was not going to stop Gold betting out and Cunningham dropped out. Once again, the cards favoured Gold at the crucial moment, as the flop presented Gold with top pair holding KJ. Next up for the chop was the one player who Gold probably feared coming into this final day. Erstwhile second-placed professional Allen Cunningham must have fancied his chances but he failed to pick up many playable hands and rather withered away before Gold ripped him up by the roots! Michael Binger raised over $1,000,000 and was called by Gold, again with KJ. Cunningham saw his chance to pick up a couple of million chips and re-raised all-in with over $6,000,000 of chips. Gold saw his chance to dominate even further despite the average nature of his hand. It was a race against Cunningham’s pair of tens but inevitably the cards favoured Gold on the flop when a K appeared. Michael Binger took over $4,000,000 home as he slipped to defeat in third place. He raised after Wasicka and Gold limped into a pot. A three-way flop ensued, displaying rag cards 10, 6s, 5s. Binger’s large bet was dwarfed by Gold’s all-in bet putting Wasicka to a big decision with an open-ended flush straight draw holding 8s,7s. He surprisingly resisted the temptation and folded, perhaps reasoning that he might jump up $2,000,000 in the pay scale if Binger came a cropper here. No prizes for guessing that Binger’s cards did not help him overcome Gold’s cards! Binger was favourite at the flop showing A 10 for a strong top pair. Gold had fearlessly re-raised – albeit with a monster pile of chips – with no more than an open-ender. His 4,3 needed a good turn or river and – presto! - the 7 was enough to complete the straight for Gold. Sadly for Wasicka, a flush would have filled on the end for him. Whether or not he could have overcome Gold is another question but he would certainly have given himself a chance. Now outchipped 8:1, Wasicka was heading for a runners-up spot which duly arrived when yet again Gold found his flop of choice just as his opponent chose the moment to move all-in. This time a flop of Q, 8, 5 looked good enough for Wasicka to push with a pair of tens. Gold’s Q9 gave him an easy call and victory in the World Series of Poker Main Event! Ed note: For a chance to win $1,000,000 download Mansion Poker and qualify for the Mansion Poker Dome Challenge!